Arabs have historically chosen London for its safe-haven credentials. Despite uncertainty over Britain’s new government and encroaching exit from the EU, London’s prime central market has not lost its allure. A year on from the Brexit vote, the weaker pound is offering significant savings for international buyers. 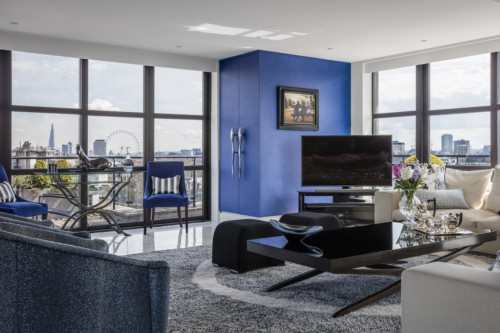 The famous and high-profile areas of Mayfair, Knightsbridge, Belgravia, Kensington and Chelsea have always attracted the most attention, with overseas families and executives flocking to rent or buy in these sought-after London postcodes, says Katherine McCullough, development director at Merchant Land. McCullough sees Marylebone as one of the most in-demand yet affordable new hotspots to emerge in recent times. Located north of Mayfair and with Oxford Street as its southern border, Marylebone has some of the very best of London at its fingertips. Marylebone has always been an incredibly fashionable area in London. Since the 17th century it has been home to many famous residents from the great poet, Lord Byron, to Charles Dickens to Sir Paul McCartney and more recently, Madonna. For international buyers, McCullough says location is incredibly important and so Marylebone is perfectly situated to allow them to enjoy luxury city living, but also be within easy reach of London’s Royal Parks. In fact, one of Marylebone’s strengths is its fantastic location, which sits just a short distance from Regents Park and Oxford Street, in addition to the Edgware Road, which is known for its Middle Eastern culture. Also, with a demand from international buyers for lateral living, there has been a rise in luxury apartments and town houses within the area. Developers are aware of the need to design these new luxury properties to meet the lifestyle requirements of the overseas investors that they appeal so greatly to. For example, providing air conditioning, lift access and 24-hour security, in addition to beautiful bespoke touches. Saul Empson, director of buying agency Haringtons, says the new generation of buyers with larger budgets and a long-term investment view are attracted to the areas that have seen impressive investment from old London estates such as Grosvenor (Mayfair and Belgravia), Cadogan (Chelsea) and Portman (Marylebone). Although the properties are smaller with less outside space, the lifestyle element is extremely attractive. Younger purchasers want access to the best shops, restaurants and night life. In a fast-paced world, buyers also want 24/7 services on their doorstep, from dry cleaning, fitness studios and healthy eateries to art galleries and the top boutiques. “Being surrounded by the traditional London but with a modern twist is exactly what is luring the prime buyers,” says Empson. He advises buyers with smaller budgets who can’t afford the likes of Chelsea and Notting Hill and who want value for money and a strong return on investment to look at property close to new transport links. Key hotspots for savvy investors are around the new Crossrail route, which will be fully functioning in 2019. The area surrounding the new Custom House station in Docklands, for example, has been subject to huge rejuvenation and has exciting new developments in the pipeline. The new rail link will ensure residents can be in Canary Wharf in three minutes and the centre of the Square Mile (Liverpool Street) in 10 minutes. Southall in Ealing, which would never have been considered a strong investor hotspot, is now also firmly on the map — prices have already increased 58 per cent since 2008 and they are only going up. Crossrail has opened up areas that would have never have been considered a sensible option either by UK or overseas purchasers, helping London’s property purchasing landscape evolve.